Today at the Verizon event in New York City, Verizon President Lowell McAdam took the stage to present the worst kept secret in the tech world: the iPhone on Verizon’s network. But what you may not know is that Verizon and Apple have been working together on the device since 2008, McAdam said. “Our strategic relationship with Apple has evolved over the past 2 years. Before many of you were writing about it,” he joked. He noted that the two companies needed to start talking back then to make sure they could get a CDMA version of the device. That work will finally come to fruition early next month, he said. To be clear: this will be a CDMA version of the current iPhone 4. Apple COO Tim Cook then took the stage to give Apple’s perspective on the partnership. He said Apple was very excited to bring the iPhone 4 to Verizon’s 93 million customers. And he hopes more will join. “We had been talking to Verizon for a while,” Cook confirmed. 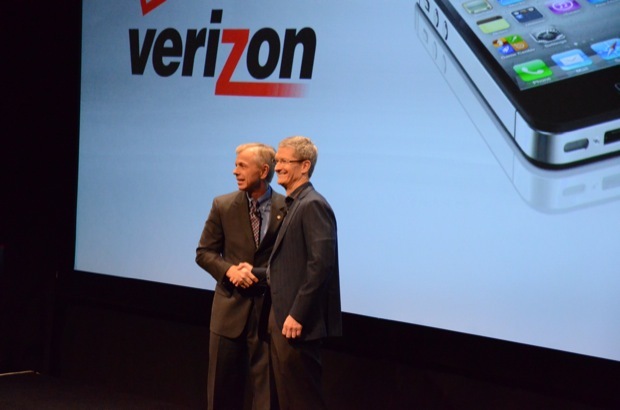 “This is just the beginning of a great relationship between Apple and Verizon,” he said. The Verizon iPhone 4 will launch on February 3 exclusively first for current Verizon customers. It will launch on February 10 for everyone else. It will be the same $199.99 price for the 16 GB model and $299.99 for the 32 GB model. One key difference from the AT&T version is that will be able able to be used as a personal hotspot — you’ll be able to connect up to 5 WiFi-enabled devices. Which is awesome. “The most popular question has been: when will the iPhone work on Verizon’s network?,” Cook noted. Now we have that answer.